Congratulations on your new embroidery machine! Hi, I’m Sue O’Very, BERNINA Ambassador and machine embroidery expert. Becoming an expert didn’t happen overnight. Just like you I once was new and ready to get stitching but was a bit overwhelmed. I’m here to help make machine embroidery a fun and successful experience. Before we begin stitching I’m going to cover four basics of machine embroidery in part 1 of my Embroider-Along. You might be wondering just what is an Embroider-Along? I’m excited to say it will be a series of helpful blog posts for the beginner as well as the seasoned machine embroiderer. This Embroider-Along will be a place of education and guidance for the beginner. For my seasoned machine embroidery enthusiast it will be a place of reassurance and perhaps learning a few new tricks. Let’s face it, some of us have been machine embroidering for 20+ years and over time, things have changed. There are four basics of machine embroidery to cover in the Embroider-Along series so you get the best results when machine embroidering. Choosing the correct stabilizer can make or break your project. There are hundreds of different stabilizers on the market however, when broken down, there are just a few types. 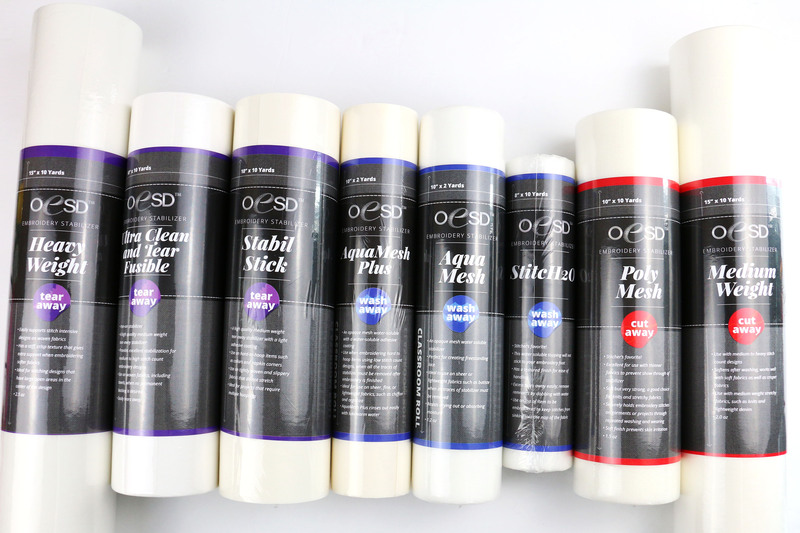 The best way to choose stabilizer will depend on the type of material you are embroidering on. Will you be stitching on knit, woven, sheer fabric or a napped fabric? During my Embroider-Along I will cover which stabilizers are best based on the type of material you are using in your project. Needles play a huge part in stitch quality on basic sewing so you can imagine when your needle is going up and down 600-1000 stitches per minute it’s even more important to get it right. Just like stabilizers, needle selection can seem daunting but there are just a couple of basics. Needle selection depends on the material and thread type. 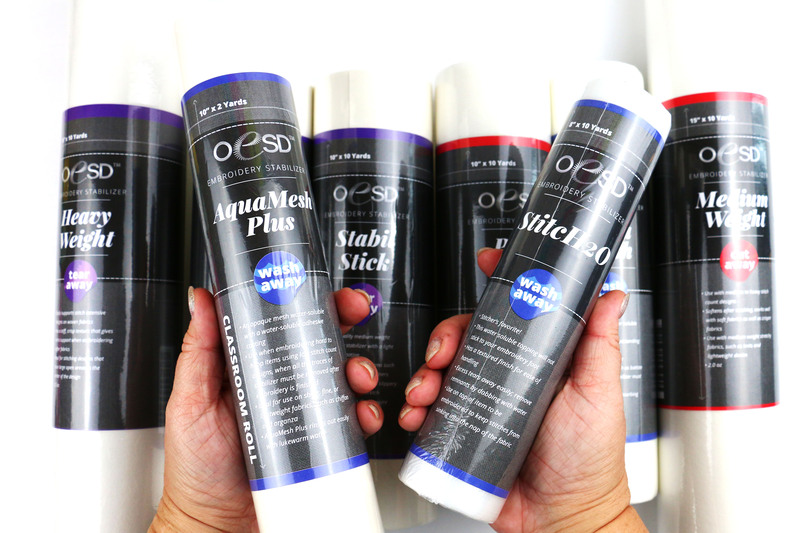 Will you be using metallic, polyester or rayon thread? 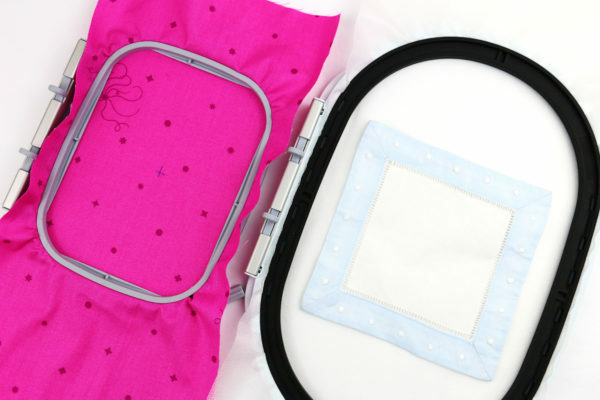 Will you be stitching on a baby Onesie or thick towel? These will be part of the topics of conversation in the Needles portion of my Embroider-Along series. What effect are you going for: matte, shiny or metallic? How will this item be laundered? Does the embroidery need to be durable? My goal will be to show you the fastest and easiest techniques to provide you with results which will impress your friends. Start following along! Check back here each week to see the next lesson and prepare to learn something new. As a part of the Embroider-Along there will be 12 weeks of lessons and (of course) some adorable final projects. Each blog post will bring you closer to mastering the basics of machine embroidery. I’d love to hear what you think of this and also additional topics you would like me cover. What do you want to learn more about with machine embroidery? Until next time, I hope you have a creative day, bye-bye. Excited for learning about embroidery. Just purchasing a new machine and this blog seems like it will be a great learning tool. Thank you! Always good to revise the basics too. How do you get signed up to be notified? I’ll be following along! I’ve been machine embroidering for over 5 years, but am always interested in the latest developments and how others follow the process. Looking forward to learning as much as I can about machine embroidery. I have a new machine and want to try everything – towels, sweatshirts, etc! Thanks for creating this for us newbies! How about free standing lace and napkin corners? Great idea. 3D FSL too? I really enjoyed the write up. Please , are free softwares to download for embroidery? Am using PE800 brother and the software is extremely expensive for me. This is a good spot to learning what all the Bernina can do and how as well. Thank you, Sue! I do have a question…how do I download an image? I have tried a couple times, but it seems as if the machine is not reading my USB, because the files don’t show up on the screen. I’m using the .exp file extension. Do you think you could tell what all m doing wrong? I have the same question about downloading and using an image. I’ve tried downloading, but I must be saving it in the wrong format. It would be helpful to better understand this process. It is my pleasure. I am happy to have partnered with BERNINA to bring you some good info. Excellent question on the downloading, I think you mean embroidery design (vs Image). In which case you will want to make sure the design is saved from the computer to your desktop. It will come as a zip file. You will need to unzip it and then only save the .exp file to your usb. You might already be doing that, in which case, let me know a few more details. If I am unable to help, we will be sure to get the answers for you. Are you using a Bernina USB stick? You may want to check to see if your USB is compatible. Looking forward to an Embroider-Along. New hints and techniques are a great idea. I hope we have a chart for some of this info: 4 basic types of fabric, most common stablilizer type, needle, thread, type of embroidery pattern best used for each – especially if you are last minute gifting and hope for no “issues”. Sort of a general idea table. Each manufacturer has one for their specific brand and updates are numerous. I hope we see some embroider ideas each blog. Thanks! Tables or charts would be sooooooo helpful! I’m brand new to this and that would make it so much easier. What a great idea! It will be 12 weeks long, this is the intro (#1 of 12). Each week I will cover new topics. Very excited about this bog! Thank you so much for doing it! I’m really looking forward to learning more through your embroider-along. 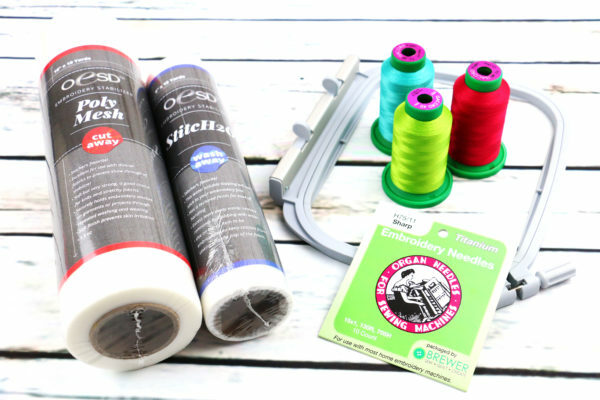 I’ve been using single-needle “home” embroidery machines since the original 4″ hoop machines of the 80s but I’m sure you will have hints and tips to make my embroidery projects even easier. Hooping and design placement always seem a challenge. In this series will you be teaching how to actually use the embroidery machine and how to bring in designs from the software so you can arrange them in the hoop and stitch them out? I really need some help with these. I have been trying for a very long time to figure it out and can’t. Or if you aren’t teaching this, is there somewhere I can learn this? I would be so grateful for help.Thank you. How are we notified for each session? Can you describe how to split the embroidery design and do multihooping. I bought a New Series 570 QEE…. will this series help me? First of all Congratulations!! I got a chance to play on the 5 series and they were just wonderful!! Yes, this will definitely help you because knowledge is power. Especially when it comes to our hobby. For me, it is all about learning different ways of getting to the same results and then making it your own! I am here to help you through your new journey!! Always enjoyed your ITH projects, this sounds like fun! Can’t wait for it to start! I just discovered this embroidery-along workshop. How can I view part 1 which was on Dec 4th. Yay!! It will be once a week, days may vary. Thank you! I’m back to embroidering after about a decade lapse and am surprised at how many more stabilizers and such there are now. It’s been a bit overwhelming. Very timely. I think the timing is great, just in time for the holidays! Wonderful idea and very timely. How do we sign up? Just keep checking back each week. Definitely by Friday of every week there will be a new post. Oh and if youfollow BERNINA on Instagram and Facebook is a good way to follow. You can also bookmark THIS first post and scroll to the bottom and we will always include the latest link. Thank you for sharing your knowledge…always need more education! Is embroidery on towels covered in the napped fabric lesson? If not then maybe you could all that to one of your sessions. I have been embroidering for a very long time. One problem I have is knowing when a design will be too dense. Can you help? This is very exciting – I have a Bernina 880 Plus and have done some embroidery; however I want to learn more. All of the items you will be covering will be extremely helpful – thank you !! Will all of classes be consolidated in one area on the We-All Sew site for easy referral so one does not have to search for them? Thanks !! Best thing to do is bookmark this post. The. At the bottom of the post we will keep the links updated so you can view the others. I’m really looking forward to this. I’ve had my embroidery machine for some time now and have been struggling to learn the ins and outs. I have a Bernina 580 and have not found the instruction manual easy. There seems to be a steep learning curve. My local Bernina dealer closed and the company that took over seem to be more interested in selling me a Brother or Babylock than helping me learn my machine. First off I’m so pleased you are following along. Here we will be covering lots of basics and I’m here to answer questions. 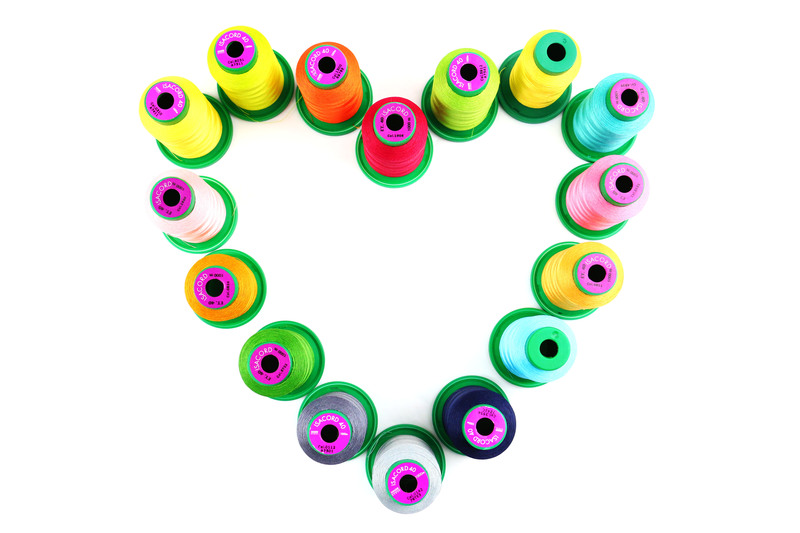 There are lots of resources for your machine here on We All Sew, do a quick search for specific topics. Keep at it, with these amazing machines there is a learning curve for everyone, you are not alone. Feel free to join BERNINA on Instagram and Facebook too. I too am excited about learning more about machine embroidery. Have done a few things but still feel a bit overwhelmed when I think about stabilizers. Looking forward to each lesson. Thanx for doing this. Oh we’re are talking a lot about stabilizers. Bookmark this page so you can keep following along on the latest part. Looking forward to these classes. I certainly need them. Thank you for doing this. This blog is exactly what I need. Even though I took the Bernina class for my new embroidery machine, I still feel overwhelmed. Learning the software if one thing; learning all the bits connected with embroidery is another thing. I have so much to learn. The blog will allow me to slow down and re-read until I get it. Can’t wait to begin! Thank you. Thank goodness you started this class. I am a very new beginner, like it’s still in the box! Now I can take it out and hopefully learn how to use it. Thank you so much! Got time to add embroidery on towels and knockdown stitch too? Very happy to know you are doing this blog! Very excited to see what’s next. Will it be the same day every week? If so, when will we see the next blog? i would like to know how to make corrections, i.e. like when the thread breaks. Also, how to “get out of a design” if you need to stop and re-hoop, take out a mistake, etc. I always just wind up turning the machine off, then back on again and starting all over. It seems like i get stuck in the design. I am so excited to learn all this information. I bought the 880 anniversary edition and one of the exciting things i want to learn is all the things you have listed. There is so much to learn and thanks for sharing this information. When will each one start? 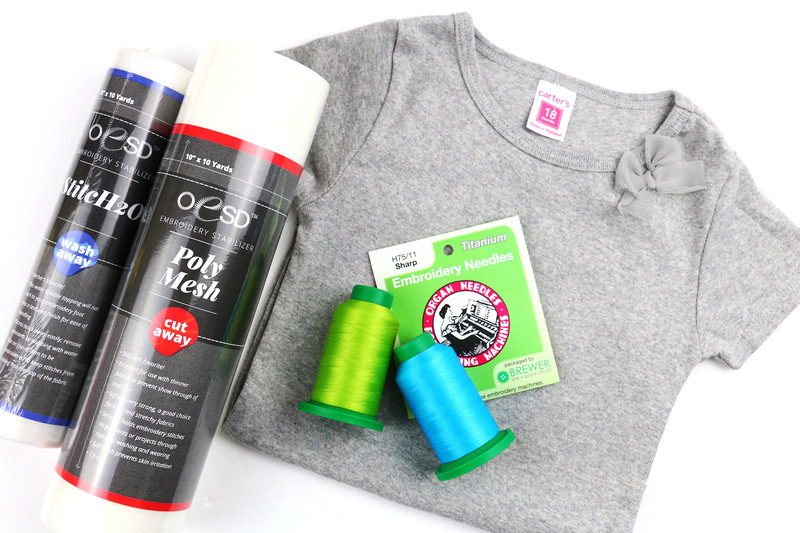 Oh and one more thing – do I need embroidery software? I want to do monograms and such and just do not understand if it is necessary. The Bernina software is SO expensive and not sure I need to spend that much money for my needs. Thanks for your assistance. I started embroidering ages ago on myArtista 165, stopped for a while, and now am embroidering on my 830. I am confused about the difference between .art and .exp and what I should be using. It’s a great question. Basically the ART is the raw editable format (when in software) and the EXP is the final format to stitch. My BERNINA 790 plus seems to enjoy the EXP best. I started with a B580 several years ago and that was the beginning of my foray into machine embroidery! I just bought the Anniversary Edition 880 Plus and am very excited to learn how to use the newest features like pin point placement, continuous embroidery and especially how to place my designs properly so they aren’t crooked. I’ve done a lot of labels for quilts and things on shirts and jackets, but I am still quite the beginner so I’m very excited! I’ll be especially interested in how to do a pillowcase! 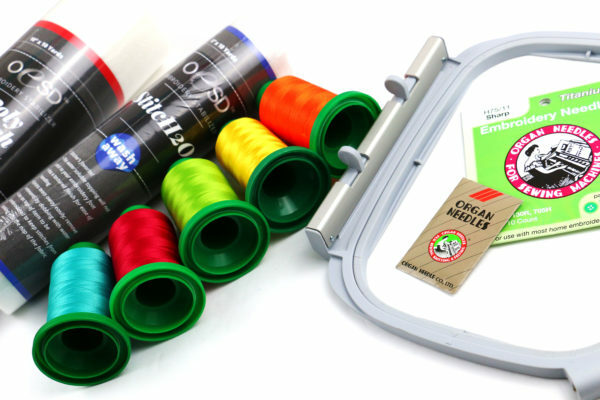 Also, can other embroidery threads be used other than Isacord? Thanks for sharing your expertise with us! Keep following along all of the parts and you’ll see I cover the exact question about threads!! Looking forward to brushing up on my basics. Oooh and metallic threads. Mine keep breaking. I have the 770QE with embroidery module. I have used it several times. Each time I get it out and get started I wish for the same thing, a quick concise start up guide. The Bernina book just has a lot in it and can be complicated. I just want a short step by step to follow, “turn this on, push this button, etc.”. Thanks for writing in. Have you talked with your local dealer about this? My advise would be – don’t be afraid to get in there and play around. There are also some excellent videos on the BERNINA YouTube channel. Need to know how to evaluate design properties, density etc for appropriateness to end use. Embroidered a towel with dense design and it is just too heavy for the towel. Looks terrible. How do I decide when to use a design? Also, it was impossible to hoop the towel. Just too heavy for my hoop. What to do? Look forward to learning more about embroidery. Thanks for the blog sew along series!! This is a good question. I’d say that much of this is by trial and error and learning by experimentation. Though I do reference density and what the ideal design would be for particular materials throughout the series, every design would need to be evaluated. In general though, if you start off with using the designs I provide here with the materials, needles, threads, stabilizer, etc, you will learn a great deal. Each part will cover in detail all these things. Here is the part on towels, however, I would really encourage you to go through all the parts in numeric order. I have a 630 and know so very little about embroidering with my machine. I’m really excited about following the WeAll Sew with you. I’m hoping to learn how to do something besides monograms. Enjoy and please let me know if you have any questions along the way!